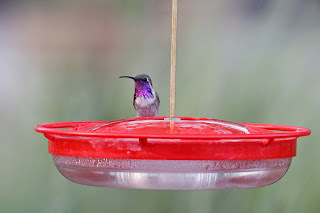 Missing from my earlier reports on Arizona are some of Connie's favorite birds - hummingbirds. 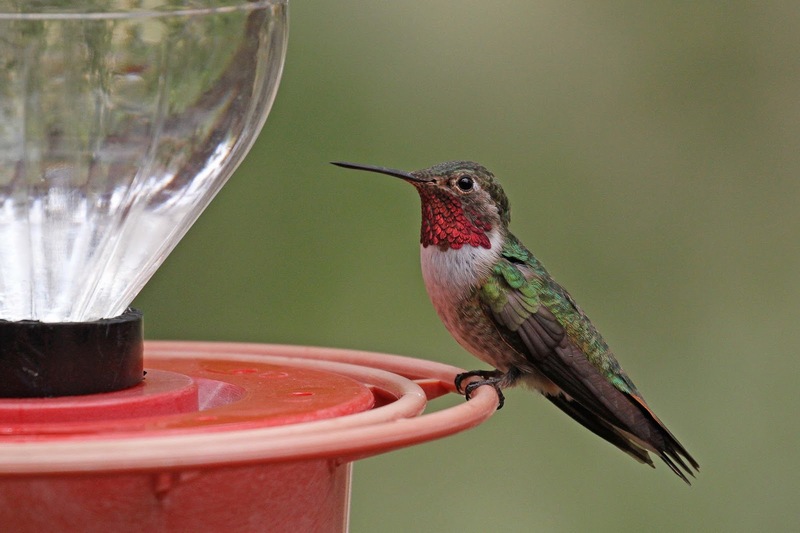 In our area, we have one type of hummingbird which is Ruby-throated. Don't get me wrong, they are splendid little gems that make us all smile all summer long. We have a pair that nest in our yard every year and drink from our feeder before heading south for the winter. I hang the feeder on tax day every year and wait with anticipation for the first sign that our man is back. This year, I didn't see him until after our return from Arizona which was fine because we had plenty of hummers to look at there. 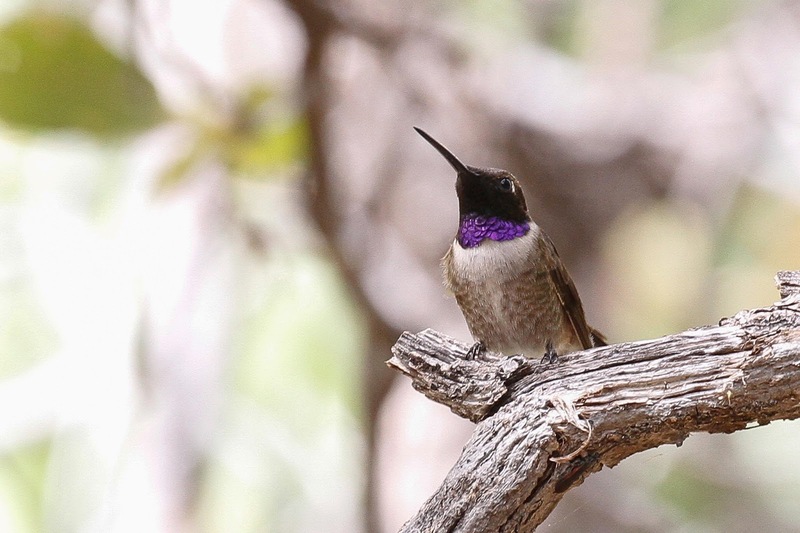 Arizona is in the west and for some reason, they get many species of hummingbirds there. 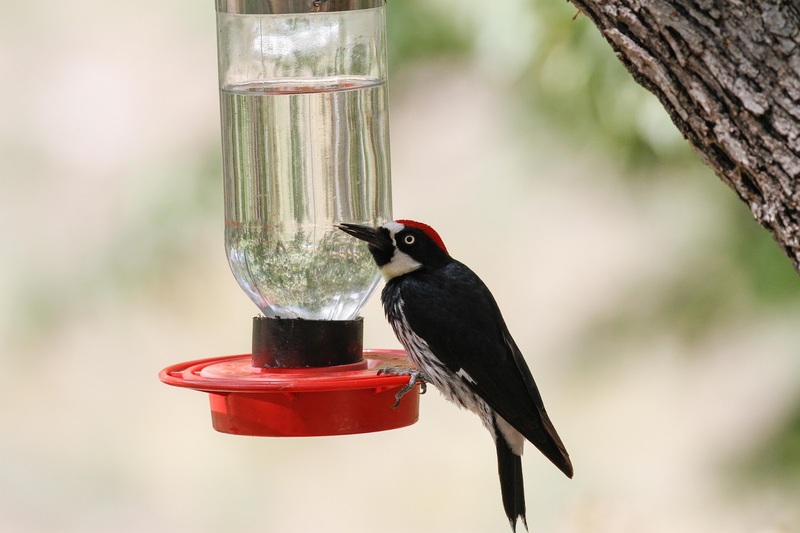 Many people, restaurants, hotels and gift shops hang feeders to entertain their visitors. We sat at a few of the famous hummingbird stations including Madera Canyon, Paton's Yard and Beatty's Guest Ranch and were treated to some awesome birds. 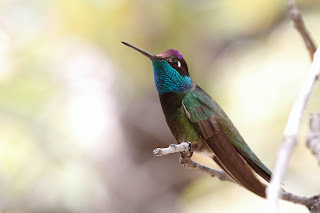 The most common hummer at all feeders was Broad-billed Hummingbird. You can tell this bird by the overall dark body and bright red bill. Not to be confused with the Broad-tailed Hummingbirds which have a red throat like our hummers but also have a rufous or green "vest". 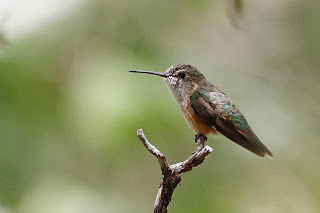 Like most hummers, the Broad-tailed female is pretty plain. This allows her to hide in the nest better. It's no secret that hummingbirds are the smallest bird species but when you see many species mixing it up at feeders, you can see that even within this group, some are tiny. The Black-chinned Hummingbird is pretty small but very mighty. This guy chased much larger birds away from "his" feeder at Beatty's Ranch all day long. You can see from this photo that if the sun catches his chin just right, it is actually purple, not black. Here is is in mid flight chasing off another bird. 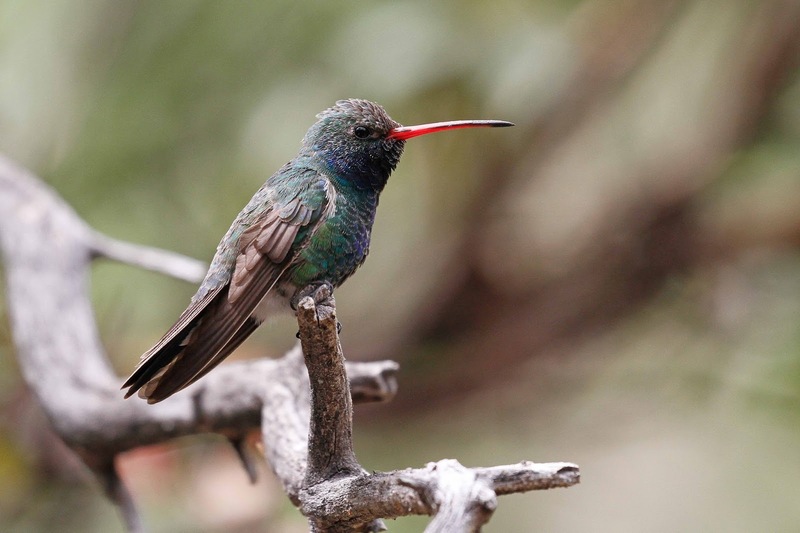 If Black-chinned is one of the smallest hummers, then Magnificent is one of the largest and, well, magnificent. I'll let you decide for yourself. 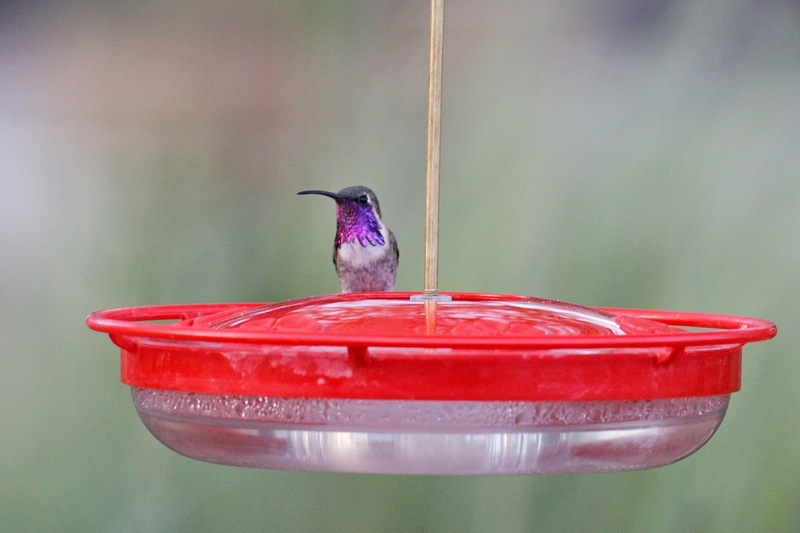 Even with all of the hummingbird diversity, Southeast Arizona also hosts some rare hummers. 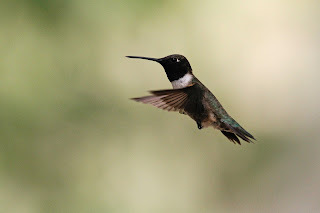 We spent an evening at Ash Canyon Bed and Breakfast with host Mary Jo to get a glimpse of Lucifer hummingbird. This is one of 3 different males that came to the feeder just before dark to tank up on sugar water before finding a roost for the night. 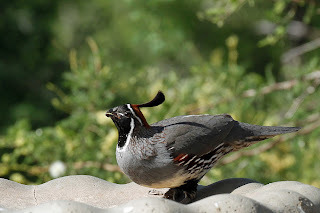 It's funny to see other types of birds at the hummingbird feeders. This Acorn Woodpecker figured out how to get his tongue into one of the holes. 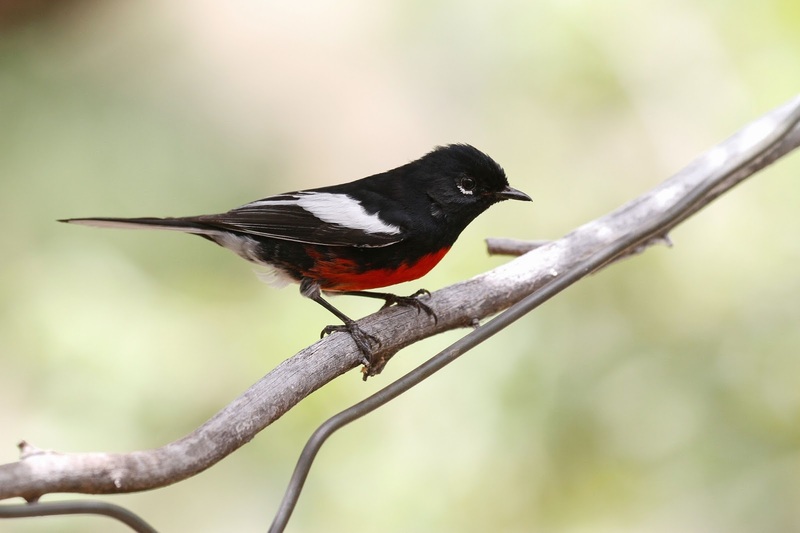 And this Painted Redstart which is a warbler also tried his luck with the sugar water. Here he is getting ready to jump on the feeder. Other birds came in to grab some seed from the other feeders. 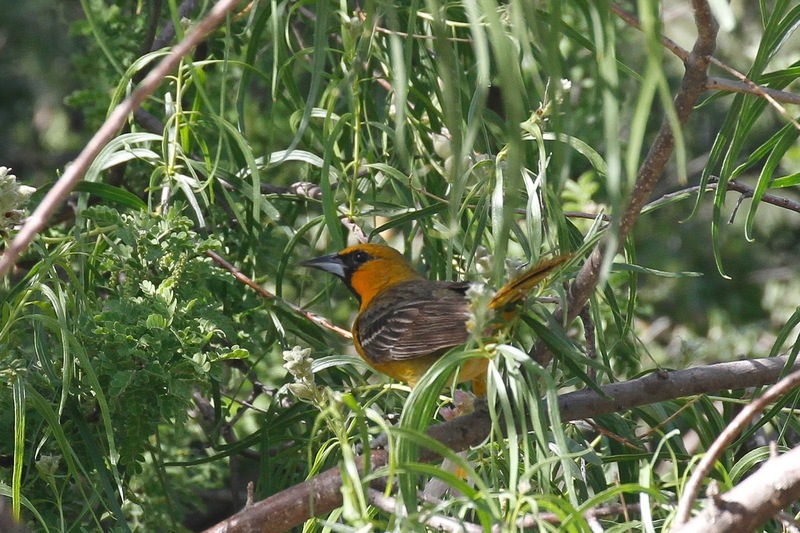 This very rare Streak-backed Oriole was reported at a famous yard that I love the name of - "Bob Rodriquez's Yard (formerly Dave Jaspers yard)" I guess Dave moved to another house with an awesome yard. We visited in the middle of the day and sweated our asses off but didn't see the bird so we went to lunch and returned later. We got to see the bird a few times. He loved the oranges that Bob had speared around the yard. 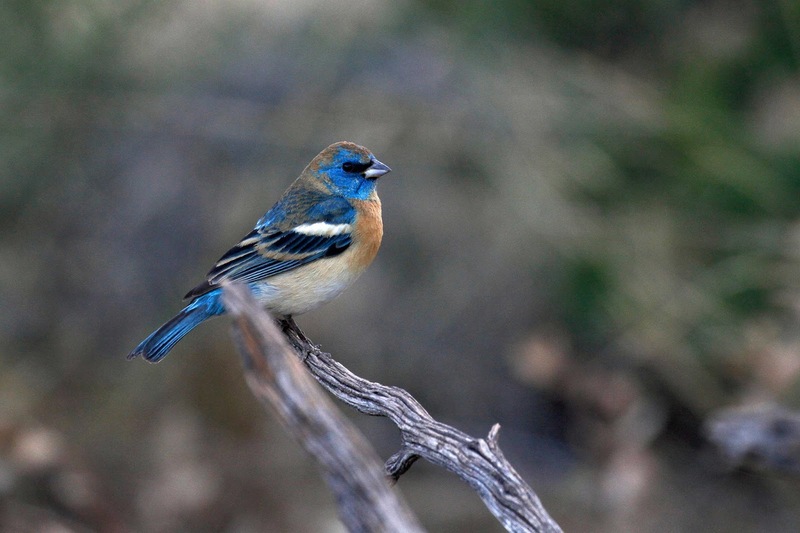 This is Lazuli's Bunting which is really cool to see. 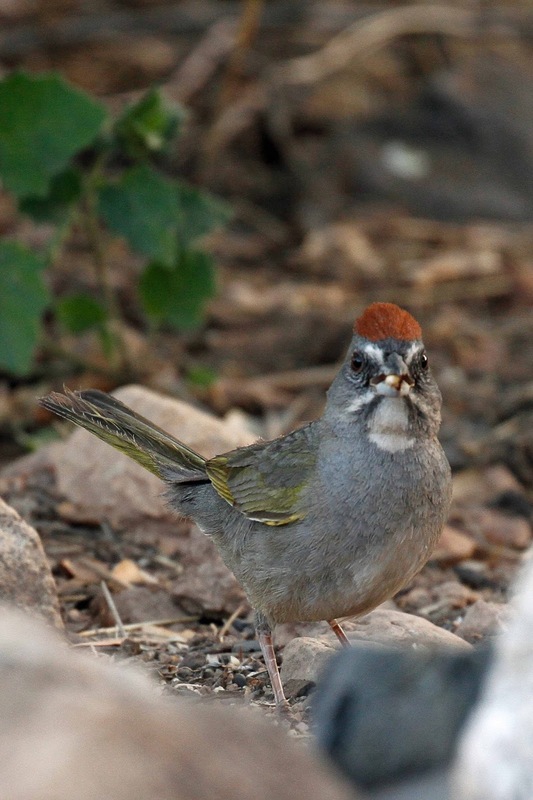 And Green-tailed Towhee pecked around on the ground. Most of the feeder stations also had water features which attracted this Gambel's Quail. These quail have crazy feather plume sticking out of their heads. 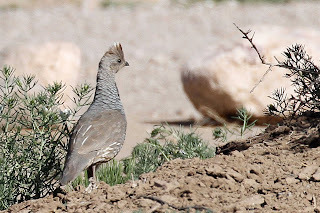 And this Scaled Quail which was a life bird for us was hanging around another feeder. Not as gaudy but still a nice looking bird. Many people go to Arizona and forego the rigorous hikes up the canyons. They simply spend time at the feeders and get to see all of these cool birds.